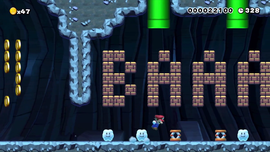 Shaun's Mossy Mole Mischief is an Event Course in Super Mario Maker, released on June 4, 2016, and based upon Shaun the Sheep. It unlocks the Shaun the Sheep Mystery Mushroom costume upon completion. The level begins with a long segment consisting of several Lifts and Bumpers, along with some Monty Moles. Eventually, Mario will reach a P Switch, and must press it and run over to an area with a Warp Door, then jump on a few Bumpers to reach some more Lifts. After passing a tower-like structure, a Checkpoint Flag is reached. Like the previous area, Mario will hit a P Switch, and must head to the right and continue into a warp pipe. Mario will then be pushed by conveyor belts to another Checkpoint Flag while the Shaun the Sheep fanfare plays. Mario must then traverse more Bumpers while avoiding Bull's-Eye Bills. After hitting a Big Buzzy Beetle into some Brick Blocks, Mario must head to the right to find some coins arranged to spell "BAAA!". A warp pipe immediately follows, along with the Goal Pole.